Professional Dental Implants from $2800 currently is offered in Melbourne for patients in the CBD at our lowest cost price and is both high standard and cost-effective. We provide Australian approved, world class dental implants for cosmetic and functional objective that is certainly guaranteed and allows for the most suitable treatment for your smile. From our convenient location in Burwood East, to our practical office hours, we attempt to ensure your visit uncomplicated and enjoyable. We’re very proud of the highest standard of excellence in dental care obtainable in Melbourne and we have been known to change our patient’s lives with perfected function and certainty. . Our dentists are Australian trained and accredited to the very high standard that you have entrusted. Success of dental implants vary, depending on where in the jaw the implants are placed but, in general, dental implants have a rate of success of up to 98%. With proper care, implants can last a long time to come. • Improved appearance. 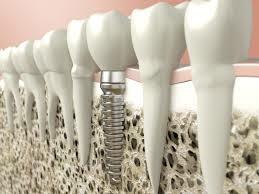 Dental implants feel and look like your own teeth. And since they are intended to fuse with bone, they become permanent. • Improved oral health. Dental implants do not demand reducing other teeth, as a tooth-supported bridge does. Due to the fact nearby teeth are not altered to help with the implant, more of your own teeth are left intact, improving long-term oral health. Individual implants also allow easier access between teeth, improving oral hygiene. • Durability. Implants are certainly durable and often will last very many years. With good care, many implants last a lifetime. • Convenience. Removable dentures are simply just that; removable. Dental implants take away the uncomfortable inconvenience of removing dentures, as well as the need for messy adhesives to ensure they are in place. Unity Dental has become a place to go for many residents in the City of Melbourne since we have along tradition of producing good results for our patients whom have started to trust in our care. We offer advance solutions for your care and comfort as you’ll enjoy the latest equipment out there in dentistry. With electronic digital Xrays, Intra Oral Cameras, Ceiling positioned TV’s and Laser Dentistry, it makes the Unity Dental Difference! Dental implants can restore your capacity to chew and smile with confidence for anyone who is missing just one tooth or many teeth. Unity Dental dentists, are widely preferred for their experience and talent in implant dentistry. Whether you are missing one tooth or a couple, dental implants may be right for you. Dental implants are surgically attached below the gum line and act as anchors for replacement teeth, dental bridges, or dentures. Dental implants fuse to the jawbone to provide a stable foundation for replacement of teeth, ensuring your smile will almost always be healthy for years into the future.